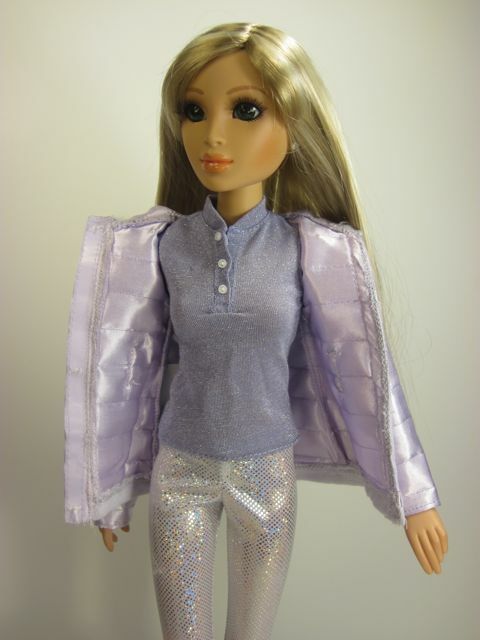 One of the problems with a discontinued doll like Lorifina is that it is difficult to find a wardrobe for her. 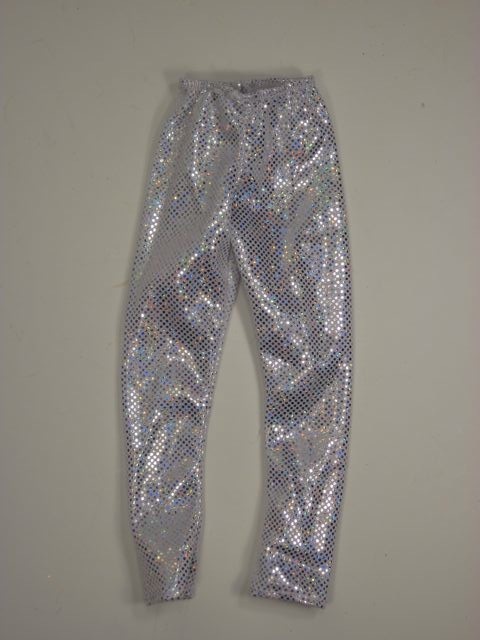 Occasionally, there are single items of Lorifina's original wardrobe on eBay, but it gets tiresome to seek out pieces of clothing one at a time, and the shipping costs can really add up. So, I have been searching for a current line of dolls that can share clothes with this tall beauty. I've scoured the doll aisles of several stores looking at all of the dolls in the 20" range and, of all the dolls I've seen, the BFC, Ink. girls are the closest match. Although their heads are larger than Lorifina's, the BFCs have bodies that are slim and tall like hers. 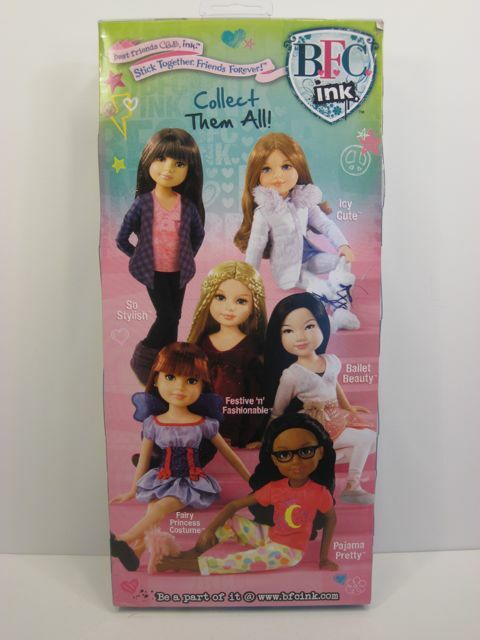 BFC Ink dolls are 18" articulated dolls made by MGA Entertainment. They remind me a bit of American Girl dolls, but are slightly shorter and have slimmer bodies. BFC stands for "Best Friends Club," but I have no idea why they spell "Ink" that way, assuming it is short for "incorporated." Anyway, I've come close to buying a BFC outfit pack several times, feeling pretty sure at least some of the pieces would fit, but haven't really loved any of the clothes enough to spend $14.99. Today I found a nice outfit that looked like it would coordinate well with my Lorifina's other clothes, and so I decided it was time to put this idea to the test. 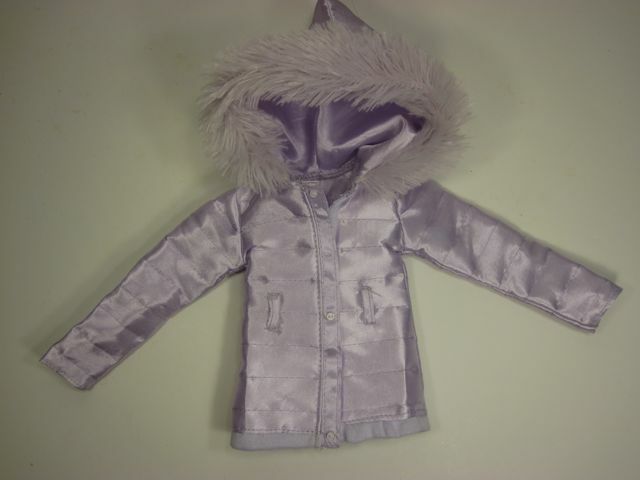 Here's the outfit, it's called "Icy Cute:"
almost worth $14.99 on their own. Almost. The packaging is ridiculous for a single outfit. It comes in a big plastic box and the whole outfit is stitched onto that cardboard background in about twenty different places. 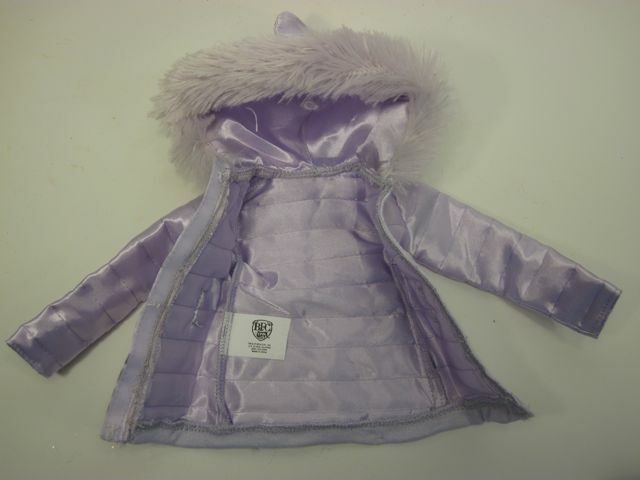 The coat is a shiny lilac quilted jacket with a fake fur-lined hood. 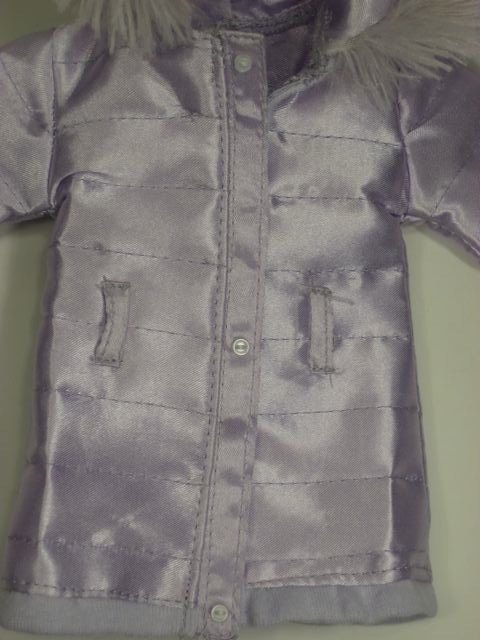 The jacket fastens with velcro, but there are decorative white buttons on the outside that look cute. 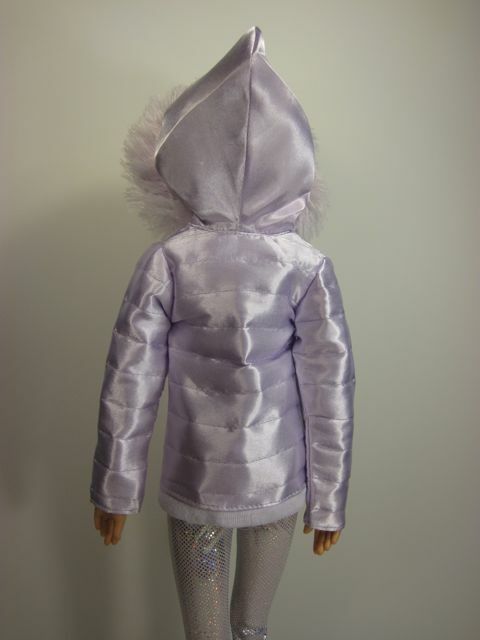 The details in the jacket are nice and I like the light purple color, but I worry about the shiny fabric snagging too easily, especially with all of the velcro in this outfit. 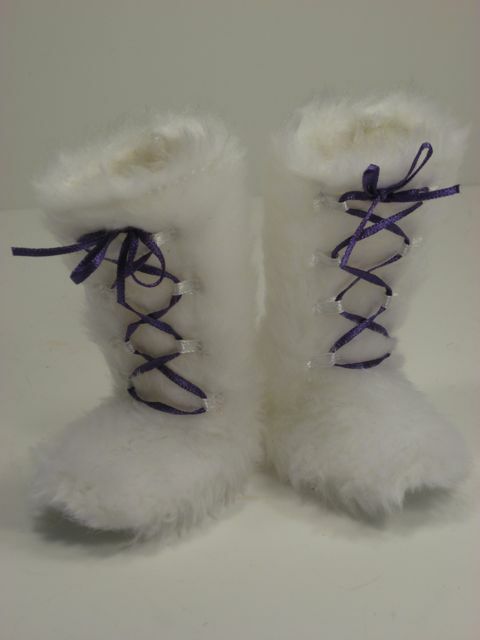 I love the Yeti boots! 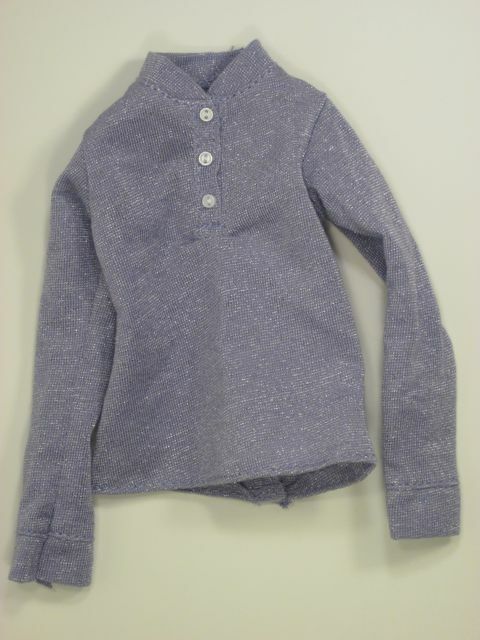 There's also a shimmery purple long-sleeved shirt with a three-button collar. 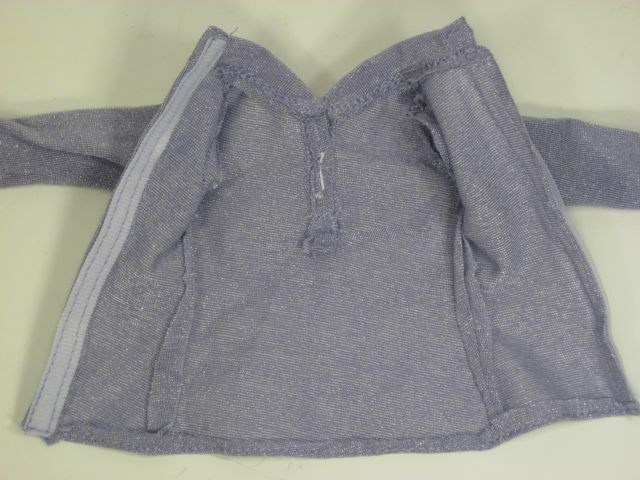 The shirt is made of a slightly stretchy fabric. All of the seams and stitching are very nice. I held my breath and tried everything on and....it fits! Pretty well! The pants are short--like capri pants. It could be that they are meant to be a bit short, but I suspect that the BFC girls are also shorter in the leg than Lorifina. I'll have to try another style of pant some day. The jacket fits, kind of, but it doesn't fasten up all of the way in front. It comes together easily until about half way up, and then there's no way it's going any further. The hood pulls up over her head nicely, though. This outfit was a very pleasant surprise. I was worried that I might not even be able to get parts of it on Lorifina (especially the shoes) but everything went on, stayed on, and looks appropriately scaled. I will definitely use all of these items of clothing for my Lorifina. In terms of the fit of BFC Ink clothes in general, and how safe it is to buy more of these outfits, I would be concerned mostly about the length of the pants and the width of the chest. If the fabrics are stretchy, like the ones shown here, the results will probably be acceptable. I would also pay close attention to the neckline styles of the shirts. One of the other outfits I saw today had a very wide, scooped tee-shirt neckline that might not be suited to Lorifina's smaller, more realistic head size. In terms of quality, this outfit stands up very well to the quality of the outfits that were made for Lorifina. The stitching is carefully done, the fabrics are interesting and attractive and the attention to detail is very good. I can mix and match these clothes with Lorifina clothes and, aside from some subtleties in the fit, I imagine it would be very hard for someone to tell which is which. I think she looks great! That coat is awesome!!!! 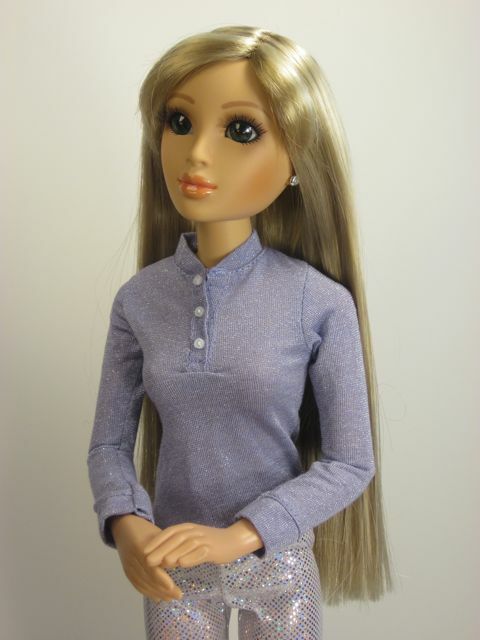 It's so funny that you have been blogging about Lorifina, as I had never heard of her until about two weeks ago when I started browsing articulated dolls on the Internet. I had seen several photographs of her, but I hadn't yet seen one "in person" out of the box. Your reviews have really piqued my interest in the gal. I don't know about American Girl. My guess is that those clothes would hang too loosely on Lorifina...and be too short. The AGs are quite a bit shorter and less slim from what I know. I could grab one of the knock-off outfits at AC Moore or Target over the weekend and let you know how it goes if you want! 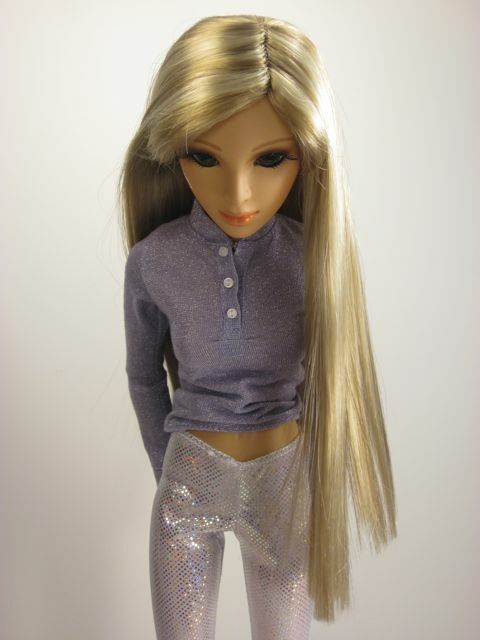 I'd love to get my hands on a Tonner 22" American Model and see if she can share clothes (or shoes!) with Lorifina, but those gorgeous dolls are pretty expensive! I was also wondering about Kitty Collier outfits. She was 18-inches so perhaps that won't work since Lorifina is more like 20 inches, right? 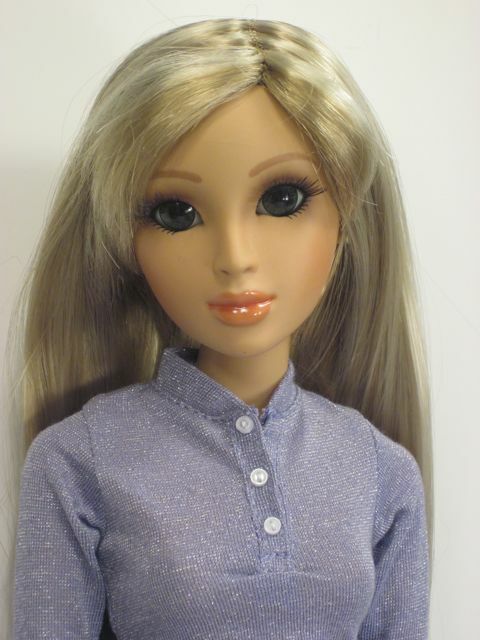 I was also wondering about the American Models or even the CED dolls. They appear slimmer than Lorifina (at least in the photographs), but some of the outfits might work. Interesting!